There ain’t no chimichangas around here, as Conan would be the first to tell you. There are no burritos, either, nor do most of the things on your “authentic” Mexican restaurant menu taste like that down here, which is generally a big improvement. (Although I admit, I kind of miss U.S.-style-Mexican-restaurant chiles rellenos, for their cheapness and accessibility if nothing else.) I don’t normally dedicate this blog space to recipes, but lately a couple people have been asking me about salsas and beans, and I thought I could spare some time to share the deliciousness. get fresh but epazote might be a bit more challenging. Hoja de Aguacate you can probably find in your local Mexican store in dry form, which works just fine. This is just for added seasoning and is not necessary (but will add to the deliciousness). Put 1/2 inch oil in the bottom of your pan (fairly large skillet) and heat on medium heat. Cut onion into fairly large pieces- it’s not important how you cut it or that it be small, just not one big chunk. Add onion to hot oil, moving occasionally, until it is browned and somewhat burnt. 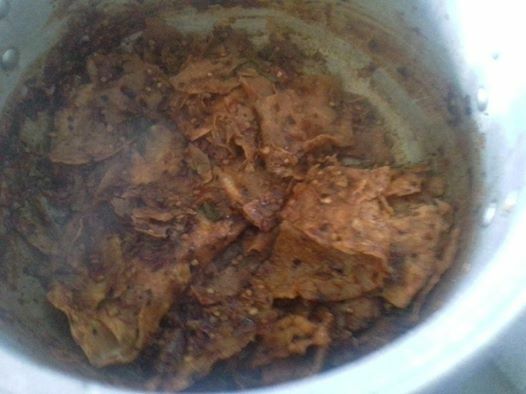 Remove onion from pan and throw it out. Now, this serves the purpose of giving the oil the flavor of cooked onion without having the onion in there. If you are very partial to having chunks of onion, cut the onion in the size you’d like to eat, and don’t fry it quite so much. Add chopped garlic to the oil, frying for just a minute or two, moving frequently so it doesn’t burn. Then add the beans along with some of the broth from the beans. How much? It doesn’t matter too much- one or two cans of beans, about 3 cups of cooked beans, enough liquid to make it a little soupy looking at first. Turn up the heat a little. Add in some salt to taste and any other seasoning (cilantro, etc.). Then mash the beans! You can use a potato masher if you have one, or use the bottom of a cup (heavy plastic or very solid glass like a coffee mug- don’t get too excited if you’re using glass!). You don’t have to mash them into oblivion- the idea is just that the beans soak up the yummy oniony-oily-garlicky flavor. Stir them some and let them cook a bit, too, so most of the liquid gets evaporated/mashed with the beans. They don’t have to cook for very long, you can cook them till you get the consistency you want. This is why the amount of liquid doesn’t need to be exact- if you put in too much you just let them cook a little longer. And voila! Ready to serve. Now, another fabulous thing about food here in Oaxaca is that it’s not all spicy, but there is almost always salsa of some sort or another. Salsa really just means sauce and there are many, many, many different kinds, depending on what kind of chile pepper you use, how you cook it (roasted, boiled, etc. ), how you process it (chopped up, in a blender, hand-ground), what other ingredients you use (tomato, lime, onion, garlic, and much more). I initially wanted to do a blog piece on salsa recipes, but realized it could take me weeks to write down the ones I know. 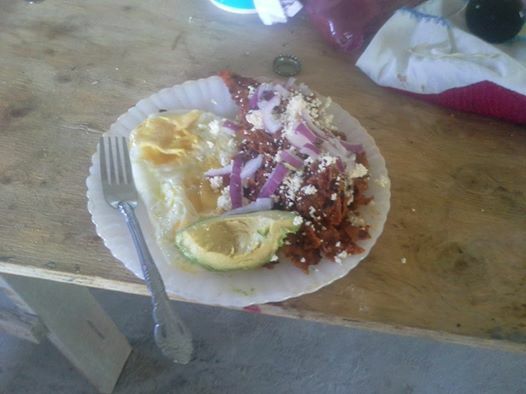 So I decided to stick to my favorite salsa, which I now use (thanks again to Paulina) for one of my favorite Mexican foods (also the BEST hangover food ever), chilaquiles (pronounced chee-luh-keel-ehs). Yep that’s it! It’s pretty much pure chile salsa with some garlic. Yum. 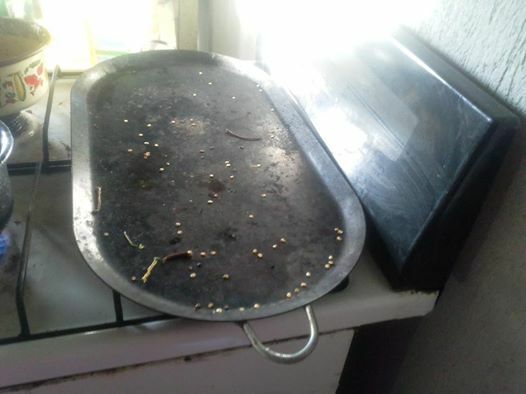 Roast your chiles in a dry frying pan (or on a comal/griddle if you have one). Open all your windows before doing this because it will make you cough your lung out if you’re just standing there in front of the roasting chile. Move them around a bit so they toast on both sides. If it gets a little black that’s okay, you just don’t want to burn it down to ashes. 2. 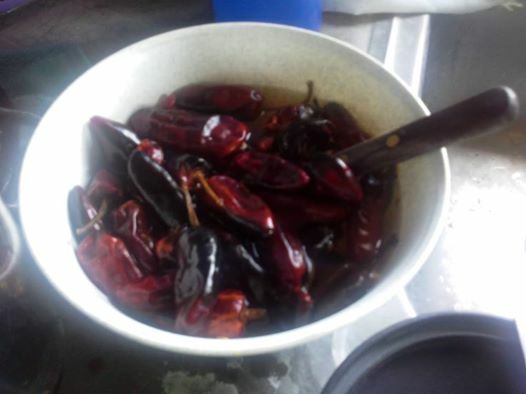 Soak the chiles in water for a little bit so they get softer and easier to grind up in the blender. Put the garlic, some salt, and chiles in the blender with just a little bit of water. You want enough water to be able to blend it, but not much more or it won’t turn out. Blend until well pureed- ideally you want even the seeds blended in there well (which would take all day with my hand-cranked blender, but ye who have electricity have no excuse). Check the amount of salt and you’re finished. Chilaquiles is a dish in the same vein as french toast; the idea is to re-purpose ingredients when they’re no longer at their peak but before they’ve gone bad. Instead of bread, you’re salvaging corn tortillas once you’ve already reheated them and they’re not soft and pliable anymore. So, yes, you can do like Mexican restaurants in Kentucky do and just use tortilla chips, but that defeats the purpose and it just doesn’t taste as good. When I lived in Kentucky, I would put my leftover tortillas (the extra ones I’d heated up for a meal but nobody got to) in a bag in the back of my fridge until I had 8-10 tortillas (good for 2-3 people, depending on size of tortilla and hunger level). You can also use a fresh package of tortillas- they don’t have to be stale tortillas, especially since it’s not like the ones you’re buying at the store there are super fresh to begin with. Here’s what else you need. 1. Fry tortillas in a decent amount of oil. This is not a breakfast for dieting. You will probably need to fry them one or two at a time so they brown well on both sides. Heat the salsa in a large pan. 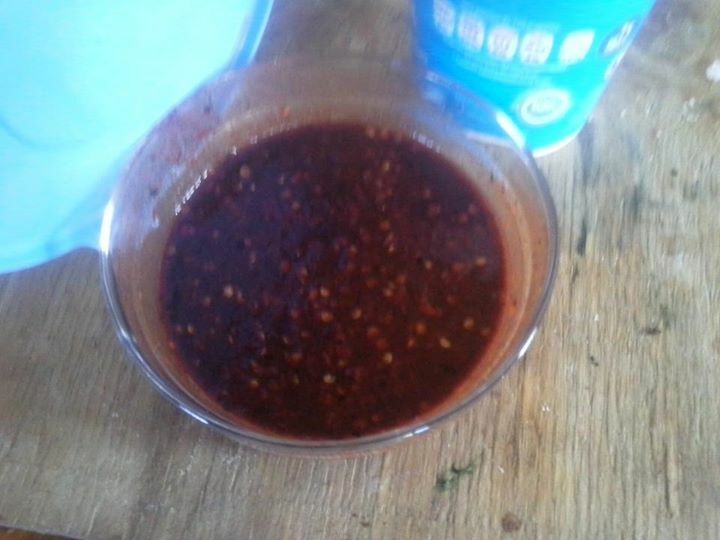 You can add in a tiny bit more oil and a little bit more water, depending on the consistency of the salsa. Add in tortillas one at a time, flipping them in the salsa so that they’re well coated. You can break them into pieces as you put them in, or they usually break up pretty well on their own as you stir them around. Do not add in too many tortillas if you don’t have enough salsa- if your tortillas are dry the dish is no good. Better to either make more salsa or use fewer tortillas- better to add more accompaniments to the dish than have gross chilaquiles. 2. Let the tortillas cook and soak up the salsa for a couple minutes (not too long or they’ll dry out) and you’re good to go. Fry up your eggs, get all the other bits and pieces on the table and you’re ready to eat. Don’t forget to invite Conan and me over!